Eleven months ago, he landed on the shores of America destroying everything in his path. 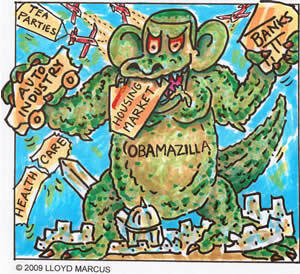 A gigantic fire breathing monster reeking havoc, consuming private sector industries, crushing institutions which have made America great and destroying lives. With fear and trembling we dare to utter his name...Obamazilla! Though appearing indestructible and unstoppable, millions of brave patriots arose to challenge the beast; vowing not to sit idly by as America as we know it is terminated. As corny and clich — as this sounds, it still holds true, "United we stand, divide we fall." Let's stand together brothers and sisters. Let's stand! Nobody or organization can claim ownership or take credit for this amazing historical Tea Party movement. It belongs solely to We The People.